The city of Tucson, in the state of Arizona (AZ), offers visitors stunning desert scenery, with a rich Hispanic and Native America heritage. Pronounced 'Tu-son', Tucson features two main historical centers, Tucson's downtown area along the Santa Cruz River, which is often dry, and the lively district surrounding the impressive University of Arizona campus. Tucson is Arizona's second-largest city and offers travelers a fun and exciting feel of the area. Set in the Sonoran Desert valley, Tucson is a spreading city with nearby mountainous scenery, known for its hot, sunny weather, historic tourist attractions, national parks and hiking trails. 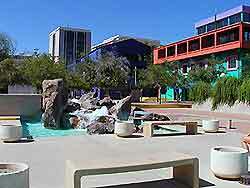 Hotels in Tucson are widespread and offer a range of accommodation in many central locations. Popular Tucson hotels can be found throughout the city's downtown district, close to the Tucson Convention Center, around the University of Arizona campus, in Tucson's Catalina Foothills area, and on the city's eastern and western sides, up to the Tucson Mountains. 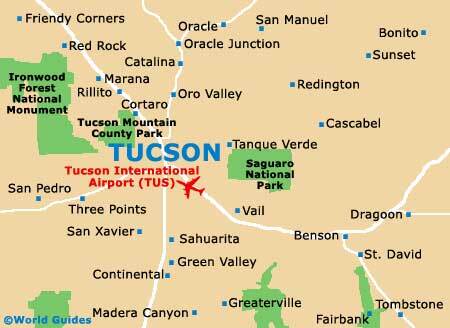 Airport accommodation for business travelers is also available around the nearby Tucson International Airport. More information about Tucson Hotels. 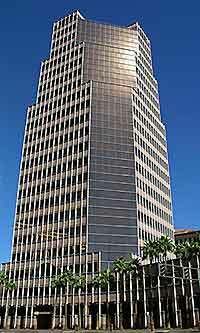 Tucson tourism is promoted by the city and the main tourist information center is the Metropolitan Tucson Convention and Visitors Bureau along South Church Ave, at Broadway. Here you will find the latest Tucson tourist information, including a bruchure about a downtown walking tour taking in over 40 sites, and general tourism information about all aspects of Tucson life. The main tourist areas of the city include Tucson's Armory Park, Barrio Historico, downtown Arts, El Presidio Historic, Fourth Avenue and Foothills districts. Tucson offers many tourist attractions, including Old Tucson - a combined film set and theme park, used as a setting for numerous Hollywood movies; Tucson's Flandrau Science Center and Planetarium - the ideal tourist attraction for astronomers, with a public telescope, interactive exhibits and general science information; Reid Park Zoo - housing a diverse collection of animals and activities for children; and the Tucson Museum of Art and Historic Block - a large complex encompassing five historic homes. Further tourist attractions in Tucson include Pima County Courthouse - a striking Spanish Colonial-style building dating back to 1927; Tucson's El Tiradito - an intriguing historic shrine attracting many visitors who come to light a candle; 'A' Mountain (Sentinel Peak) - standing to the west of downtown Tucson offering spectacular views; Sosa-Carillo-Fremont House - a grand mid-19th-century Tucson residence, with free guided tours; the Biosphere 2 Center - a scientific dome featuring a lush tropical rain forest; and numerous parks and gardens, including Tucson Botanical Gardens, Fort Lowell Park and Tohono Chul Park. 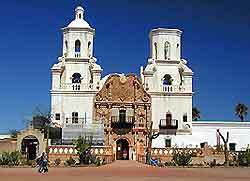 More information about Tucson Tourist Attractions and Tucson Landmarks. Some of Tucson's main museums and art galleries include Pima Air and Space Museum (PASM) - western America's biggest museum of its kind, with over 250 aircraft; Tucson's Arizona Sonora Desert Museum - containing a zoo and botanical gardens; Arizona Historical Society's Museum - with historic information about southwestern America and northern Mexico; the International Wildlife Museum - offering wildlife information and many animal exhibits; Tucson Children's Museum - housing an array of hands-on displays and educational information; Arizona State Museum (ASM) - one of the largest anthropology museums in the USA; the Tucson Museum of Art - the city's premier art gallery, with exhibitions by international and local Tucson artists; and the University of Arizona Museum of Art - housing a comprehensive collection of American and European works of art. More information about Tucson Museums and Tucson Art Galleries. Tourist attractions located near to Tucson include Sabino Canyon - known for its superb hiking tails and picturesque scenery; Madera Canyon - close to Tucson, with over 200 miles / 320 km of hiking trails and many excellent bird watching opportunities; Saguaro National Park East - to the east of Tucson, encompassing a vast of terrain, including the Rincon Mountains; Colossal Cave Mountain Park - the world's biggest limestone grotto, containing many fantastic rock formations; Tombstone - a former silver mining town, standing around 70 miles / 112 km southeast of Tucson; and Saguaro National Park West - a busy parkland with many large saguaro cactus specimens. More information about Tucson Attractions Nearby.